I have been meaning to post my thoughts on Madrid but have not gotten around to it as of yet. My apologies. I have just now found myself 20 minutes to post on the work of a wonderful artist I met in Madrid who flew in from Munich to participate in MaSAT. 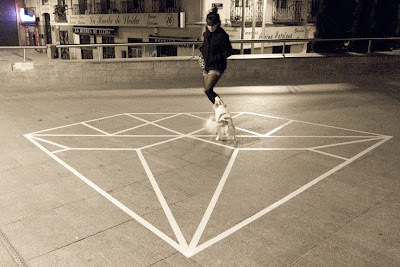 This artist is C100, and I was lucky enough to roam the city a bit the day before our MaSAT action watching him create his "diamonds for everyone". 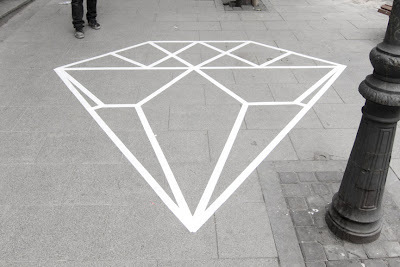 C100 uses simple white duct tape to create his work, slowly laying out the corner points of his diamond before he begins to fill it in line by line. This process takes about 10-15 minutes and is as uneventful as it sounds, save the oddity of a stranger duct taping the sidewalk. While I understood conceptually what C100 was after, what excited me about his work was not the final result but the process through which he had to go through to create his imagery. Because Duct tape is removable, C100's process is not destructive in any way. This allows him to work in very populated areas in full daylight with little expectation of police interaction. Because of this, C100's process plays out in front of passersby. 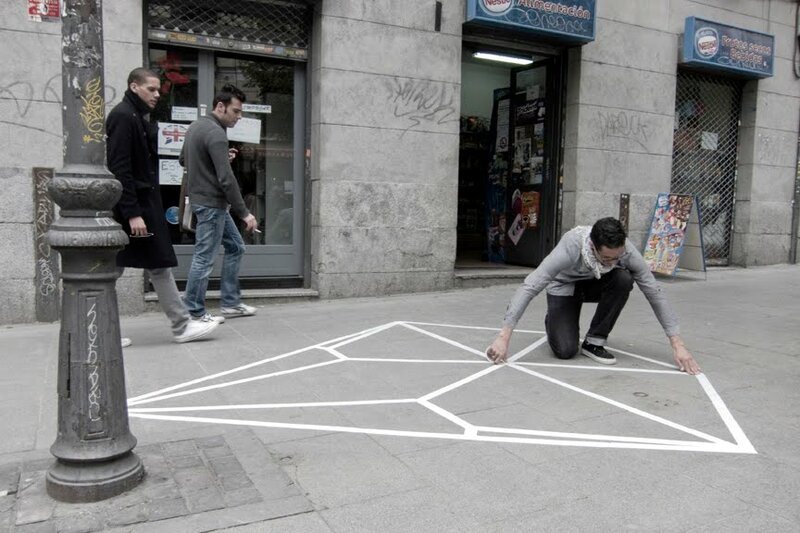 At first they are confused, stand watching as the lines of his diamonds begin to emerge and reveal the image. Skepticism turns to immediate recognition and an almost instantaneous understanding that C100's work is a gift. "Un diamante para el mundo" was the first reaction I heard and indeed that is what is was. While this may seem incredibly simple, I believe it also quite profound. So often street artists and graffiti writers practice by the cover of night because of the criminal nature of their work. They leave their mark for the world to find when they wake up. This unknown, the who behind the what, is unsettling, confusing, and ultimately contributes to unfavorable public reactions based less on the value of the work and more on the unfamiliar. While a genuinely placed stencil or wheatpaste has a power of its own, there is no substitute for the power of face to face interaction. Viewers, confronted with this very public, public art production are allowed to see who is leaving marks behind on their city and without fail they take the time to ask questions, make remarks, and become a part of the making of the art. In this way I believe they familiarize themselves with both the imagery and the producer which leads to a more open reaction to the message and imagery in general. With that said, C100's work made me realize that open public production can be an incredibly valuable tool. As strangers sneaking around at night our work takes on tones of secrecy and conspiracy, an underground who presence is unwanted. As individuals producing on the streets for everyone to see we are more easily integrated into the image of city life, the production of signs and symbols and are therefore less threatening. Interestingly as I was pondering all of this, NEKO showed me the below YouTube video called Magic Colorz. In it Graf writers in Berlin take to the streets without cans to tag the streets as they normally would but without consequence. The result is an incredibly accurate performance for the public of what goes on while they sleep. While graf may always be illegal, by simply watching these characters perform their process it becomes that much more familiar and to me that much closer to something I can understand and come to terms with.